Click here to register for Module 15. Module 15 is the concluding on-site course required for the PYTI® certification program. Module 15 is the module that ties all the modules together, and completes your knowledge base in using yoga in healthcare. 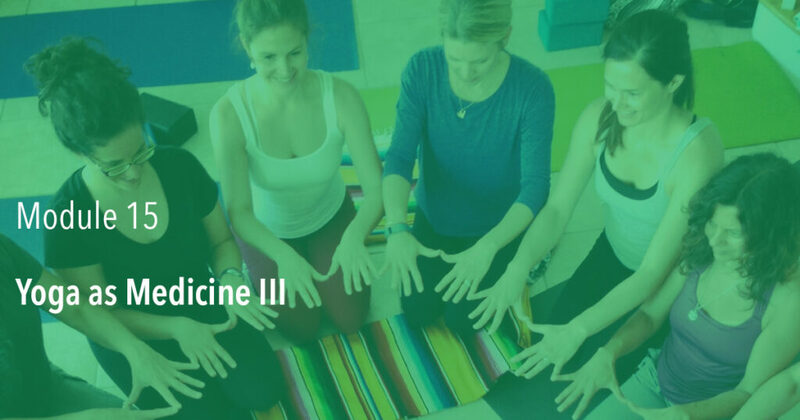 This module covers Ayurveda for the medical professional, and provides the student with templates for Ayurvedic evaluation and prescription, within the scope of practice of the Professional Yoga Therapist. Module 15 also covers facets of sound and its use during therapy, including vocal production, preservation, and music labs. Module 15 covers the advanced clinical understanding and practice of inversions and semi-inversions. Guided by the evidence-base, you will learn a new method for teaching and practicing inversions and semi-inversions. Through multiple real-time case studies, clinicians will learn to apply Ayurveda and will emerge with a more complete understanding of how ancient yoga philosophy is relevant in today’s medical model. This final module allows clinicians to practice the FMA, demonstrate understanding of the relevant roles that functional and integrative medicine play in the MTY Model, and how to affect the entire system through nutrition, movement, and mindfulness. The Ayurvedic component will teach the clinician how to incorporate use of the doshic, gunas, and attribute analyses into the broader conceptual model in order to complete the entire holistic evaluation and management paradigm. Discuss the importance of using a biopsychosocial, systems-based approach in rehabilitation based on best-evidence. Demonstrate proficiency with systems-based movement therapy and postural modification in order to successfully integrate MTY into clinical and personal practice. Demonstrate competence with Orofacial Evaluation & Treatment. Practice inversions, including headstands, shoulderstands, and semiversions and their modifications, for use in safe clinical and personal practice. Discuss indications and contraindications which would preclude practice of inversion postures. Practice all postures and their modifications from M8 (I) and M14 (II). Describe, based on best-evidence, the importance of sound, both in music and vocal production, in order to affect the musculoskeletal, neuromuscular, and neuroendocrine systems, and thus, improve patient outcomes. Apply principles of Ayurveda congruent with the functional medicine and nutrition evidence base in order to more accurately use yogic prescription and bill for skilled therapy services. Demonstrate clinical competence in application of yoga-based soft tissue mobilization and manual therapy techniques. Demonstrate use of biofeedback techniques during yoga postures to improve patient outcomes in skilled therapy services. Practice evidence-based progression of semi-inverted and full inversion movement therapies via yoga postures and breath techniques which can both prevent and manage systems-based pathophysiology(s). List the effects that polytrauma and comorbidities typically seen in rehabilitative and wellness-based patient care have on the (3) diaphragms and subsequent yogic locks system. Identify musculoskeletal and neuromuscular physiological and biomechanical factors in the trunk, upper, and lower limb through the lens of yoga postures and breath that would affect ADL or recreational participation and functional movement and outcomes. Discuss best-evidence psychobiological and neurophysiological benefits of applying yogic philosophy as functional and integrative medicine. Practice best-evidence therapeutic sequencing and postural progression(s) with gender sensitivity and specificity for both men’s and women’s health. Identify styles of management and factors in creating business organizational structure that can affect private practice. Identify current trends and regulations in private practice and health and wellness which can impact the licensed therapist or physician. Identify current trends and future regulation concerns in yoga therapy which can impact the licensed therapist, doctor, or nurse in practice. Troubleshoot emerging trends in risk management, business development, and patient care via a multi-disciplinary team approach lab sessions. Practice across-the-lifespan lifestyle coaching skills through a yogic lens that can be applied in skilled, licensed clinical and wellness-based practice. List benefits of the functional medicine approach to lifestyle and nutrition choices. Develop a best-evidence yogic/Ayurvedic culinary skillset to foster improved nutritional resource utilization and lifestyle choices in the at-risk patient with non-communicable chronic pain or disease. Discuss scope of practice and legal concerns when utilizing yoga in skilled therapy, wellness, and/or medical settings. Explain the scientific interrelationship of yoga and Ayurveda with rehabilitation and wellness care in managing non-communicable and chronic lifestyle-related diseases. List the evidence-based substrates of yogic locks system application in rehabilitation and wellness care. Understand five element theory, the guiding precepts of Ayurveda, and the governing non-theistic cosmic and physiological philosophy of its practice that overlap with modern neuroanatomy, psychophysiology, and nutrition. Identify compensatory neuromuscular, musculoskeletal, and psychophysiological patterns which could impair safe execution of rehabilitation or wellness care in licensed practice. Describe the synergistic relationship of universal structure in yogic medicine and its overlap with modern physics, kinesthetic awareness, polyvagal theory and vagus nerve function, and rehabilitation. Demonstrate proficiency with evaluation and management of live patient models using a biopsychosocial yogic model of care that is commensurate with the practitioner’s scope of practice and license. Create plan(s) of care and prescription for individual and group based therapy as part of a multidisciplinary team that includes functional and integrative medicine approaches. Identify the internal and external variables which influence allostasis in the individual, including metabolic, neuroendocrine, psychophysiological, musculoskeletal, neuromuscular, and psychoemotional effects. Integrate best-evidence functional and integrative medicine into existing clinical practice in order to prescribe skilled therapy and/or intervention according to the practitioner’s scope of practice. Distinguish between translation, location, elemental makeup, and mental qualities of systems-based disease states. Demonstrate understanding of Ayurvedic constitutions and their respective parameters through identification of at least 15 best-evidence methods for intervention in skilled therapy and medical settings. Verbalize constitutional differences in physical attributes, anatomical structure, physiology, orthopaedic presentation, gastrointestinal function, and receptive and expressive language to understand how they affect prevention and management of acute and chronic disease states. 2 yoga blankets (Mexican blankets work best). Do not bring cotton throws are irregularly, non-matching sized blankets. 1 yoga strap. Quick release buckle highly recommended. Cotton preferred. Medical Therapeutic Yoga text & previous course manuals (if preferred). Module 15 is held in the spring and fall of each year.